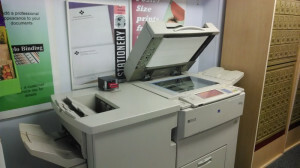 At Nott Street Office we have state-of the-art digital copiers for optimum copy quality and speed. Pictures are produced with true-to-life gray scale, and your text will never look better or sharper. Our state-of-the art copiers can produce up to 80 copies per minute! That means we can print 2000 copies in only 25 minutes, so you can drop off your job and pick it up in the same hour! No copy job is too big or too small. Feel free to walk in to make a single copy, or make unlimited sets that are two-sided, over-size or stapled. We also laminate and make transparencies. Our pricing is competitive, and quantity discounts start with projects of 100 pages. Quantity discounts can be discussed with our copying consultants. For even greater discounts we have prepaid copy card service where you can purchase a preset number of copies at a discount. We will hold and even keep track of it for you.